Mom and Dad called a meeting of their family. All of the children were there. They were hoping for a productive discussion on the family’s business, its wealth and the future. But things didn’t go as planned. Certain topics got discussed and moved forward. Other things didn’t get said, and didn’t move forward. It felt like a waste of time. Strangely, and unfortunately, this family meeting experience is all too common. We see it occur frequently in many families that we’re privileged to serve. It begs the question: why? Good intentions. Mom and Dad want the best for their children and their family. They bring everyone together to talk about the family’s business and its wealth, what the future holds, and the roles that the children might play in that future – for both the business and the wealth. They mean well. Everything starts from a good place. Insufficient preparation and support. While the intentions are good, there’s no real plan for the meeting and for the discussion to unfold openly and honestly. The parents rarely have an agenda. The discussion seems to simply start, with no real direction. Often, Dad tries to share the “big picture” for the family business (and the wealth) but it can easily come across as Lecturing.” He typically covers for not being prepared by talking too much, even rambling. The meeting can easily dissolve into a monologue instead of a discussion. Hand in hand with the lack of preparation is often a lack of support. Just as businesses engage facilitators to help steer strategic planning exercises (and tricky conversations) with leadership teams, families can do the same. These facilitators (or coaches) free up the participants to engage in the conversation instead of shouldering the responsibility of running it. Uncertainty going forward. 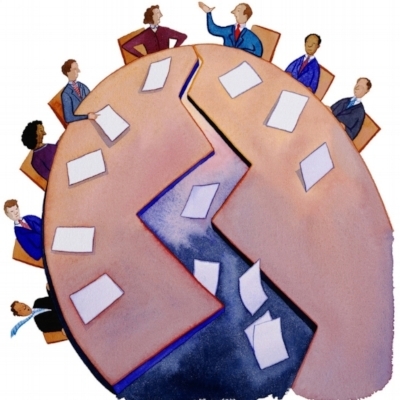 The meeting eventually ends, with little satisfaction or clarity – the opposite of what was intended. The conversation, to the extent that there is one, dwindles away. The meeting is over, but what was accomplished? Now what? Sadly, there’s rarely any adequate follow-up. When there is no follow-up, meeting attendees will often fill the information vacuum with their own “story,” and it’s typically a negative one. So, what are the key lessons learned from our own experience in working with some of Canada’s most accomplished business families? We see two key ingredients for a successful, productive family meeting. Trust is foundational. It provides a safe environment in which honest communication can occur. As we saw in our example above, no one talks if it’s not safe. Reliability. This means honouring our commitments – doing what we say we’ll do, when we say we’ll do it, and keeping our promises. Competence. Do we have both the ability and capacity to do what we said we’ll do, when we say we’ll do it? Reliability is meaningless if we don’t have the ability to follow through on what we promise to each other. Sincerity. Finally, is our public story the same as the one we tell privately? The path to authentic trust and communication opens up when we’re sincere. Conversely, gossip is an example of insincerity and one step away from betrayal. SECOND, OPEN AND CARING COMMUNICATION. Open and caring communication is really about complete transparency – and this is only possible in a safe environment rooted in trust. In the absence of transparency, family members tend to develop their own story – “fill in the blanks” – in an attempt to make sense of events. In our example above, the transparency was lacking because the trust and ‘safety’ wasn’t completely there. Does it mean the family members don’t love or care for one another? Of course not. Once we create a safe environment for respectful conversations, the openness of the communication expands. With trust firmly in place, we learn to protect the dignity and identity of each participant, no matter how ‘sticky’ the conversation. Together trust and communication can propel business families forward. Gradually, members of the family gain new tools and insights to put into play in a practical way. ‘Commit to commit.’ The first step is recognizing trust and communication as important ingredients in your family’s success and then truly committing to approach the possibilities and opportunities for improvement. Assess where you are today. Every family is different. There are a variety of techniques to assess where you are today with authentic trust and open communication in your own family – from interviewing family members to anonymous surveys and tools. Getting a reliable ‘lay of the land’ is helpful in moving forward. Enlist support. With any key issue in your business (or with your personal health), what do we typically do? Seek help from experts, whether it’s a tax specialist, I.T. provider or doctor. Enhancing trust and communication is no different. Engaging the assistance of a family coach is both support to you and to your family. Practice new tools. Through your work with family coaches, you and your family can discover new insights about the three ingredients of trust, and use them to enhance your communication - all leading to improved conversations. The practice of using these tools with confidence can often become a new ‘operating system’ for your family. Sustain the momentum. With a clear assessment of where you are today, support in place to help you move forward – and the use of new tools to put into play – you can be in a position to host regular family meetings and build on your success. The outcomes can be striking. Many of the families we serve are able to accomplish much of this – including agreement on a vision for the family wealth, identifying values important to all family members, and even developing a useful ‘glossary of terms’ to ensure they all speak and understand the same language – in as few as two productive (and focused) meetings facilitated by coaches. Roy Williams, former offensive tackle for the San Francisco 49ers and founder of The Williams Group, a firm that specializes in helping support successful, harmonious family wealth transfers. Do you see possibilities for improving trust and communication in your own family? Have you assessed where you are today – and do your advisors meet you where you are? Would you be interested in enlisting support to help you? Bob Gould is a partner at CMG. His particular expertise is understanding how owning a business affects family relationships.